Spaghetti squash is one of the coolest vegetables available. I love squash anyway, so when you can have it but it looks like spaghetti, it’s great! While baked (or even microwaved,) it is good, I think when you make grilled spaghetti squash is when it’s best prepared. Why Salt it and then wipe it off? After I cut the squash, I sprinkle the cut sides with kosher salt. Let it rest 5-10 minutes, then wipe it off. The salt helps firm the strands by helping pull out water from the squash. I think it helps the texture, but it is an optional step. 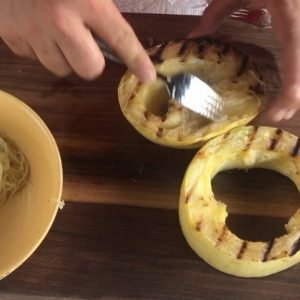 When you grill spaghetti squash, the most important thing is to have it in a two zone fire. That is, put your coals on one side of the grill, and the other side leave without coals. This is simply done on a gas grill as well by turning one side up and the other side to low or off. I start by putting the squash directly over the coals to get a slight bit of char, then moving it over to the cool side. I usually grill it direct for 5 minutes, then it generally takes about 20-25 minutes on the cooler zone to finish cooking. This will vary depending on the style and heat of your grill. If you want a more “baked squash” consistency, wrap the pieces up in foil before moving to the cool side. You’ll know it’s done when you can start separating the strands from the peel of the squash. 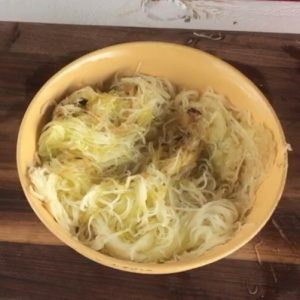 Spaghetti squash is, by itself, a fairly neutral flavor. I usually toss it with a little oil, butter, salt and pepper and just have it as a side item. However, you can do tons of things with it, so don’t be afraid to add some different sauces (I love serving it with shrimp glazed with a thai chili sauce) or seasoning and fresh herbs. Enjoy!